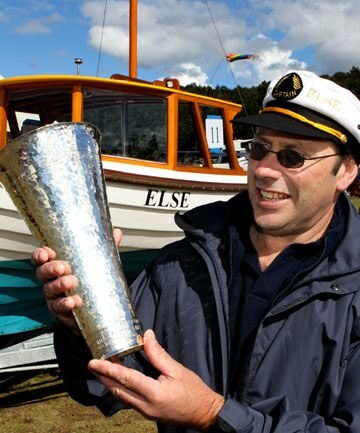 EFFORTS REWARDED: Doug Johnson won the Jens Hansen Award for the best vessel overall at the New Zealand Antique and Classic Boat Show at Lake Rotoiti with his boat Else. Neither earthquakes nor stormy weather could deter Christchurch motorhome builder Doug Johnson from making the trip north for a spot of boating on Lake Rotoiti in his classic boat Else. The effort was worth it, because Mr Johnson is now the proud holder of the Jens Hansen Award, given to the top boat at the weekend's New Zealand Antique and Classic Boat Show. Else is a Norwegian double-ender that was brought to New Zealand in 1927 by Mr Johnson's uncle on a whaling ship. It has been in his family for more than 50 years. "I was very surprised I won, especially when I saw the competition," said Mr Johnson, a fifth-generation Stewart Islander who moved to Christchurch three years ago. He acquired Else from another family member several years ago and restored it at his Hornby home, which he said was not badly affected by the earthquake. Else is made of Norwegian pine with copper fastenings and was used mainly as a transport vessel supporting the Stewart Island whaling industry. The revamp included a new cabin Mr Johnson built out of Fijian kauri. "Boats to me are like a living thing, and so much work goes into them," Mr Johnson said of his addiction to Else. Judges Mick Fone and John Harris said picking the worthiest boat was very difficult. "Else had a good story, and the album that Doug made of the restoration showed the effort that had gone into a very thorough job," Mr Fone said. John and Rosie Herd's V6 runabout Typhoon, modelled on a mid-1950s design, was the only Nelson boat to win an award at this year's show, which was dominated by Christchurch, Wellington and Marlborough boats. Typhoon was Mr Herd's first attempt at building a powerboat from plans he bought from the United States. The Wakefield explosives and dangerous goods inspector is better known at the classic boat show for his wooden canoes and kayaks. He said building the mahogany planked vessel with its hand-brushed hull was a good outlet for satisfying his love of woodwork. "I've been to this show a few times and thought I'd really like one of those boats, and knew that the only way I was going to get one was to build one," Mr Herd said. Typhoon was launched just before Christmas and has already been used for several family trips on Lake Rotoiti. Classic boat show organiser Pete Rainey said numbers were down this year, which was to be expected given the circumstances. The show was a popular event among Cantabrians, and while there were fewer numbers from the region this year, he was thrilled that several still made the effort to come. Best new boat: Typhoon, mid-1950s runabout design by Glen L Marine, USA. Built by John Herd, of Wakefield. Best classic row boat: Swiftsure I, 9.74m replica Jackson Family whaleboat, built by Ron Perano, Blenheim. Best jet boat: CWF Hamilton award, original, unrestored Hamilton Jet 30, built in 1958 by Darby Martin to a design by George Davison. Owned by Kim Chapman-Taylor, Christchurch. Best non-powered craft: Johnson Family Trophy, Silver Tern, 7.2m clinker Faering sailing boat, built in 2006 to Ian Oughtred's Arctic Tern design, by Peter Sewell, Auckland. Best powered craft: Mathieson Jeffcott Trophy, The Gull, built in 1956 and owned by Nevil and Rosemary Paterson, of Marlborough. Best themed display: Eventiac Award, Flirt, replica Royal Mail steamship built by Lionel Jefcoate, of Havelock, and launched on Saturday morning. Owner Robert Hamlett, of Wellington, had his entire crew thematically attired in navy and white stripes.